May 26-On Saturday, May 26, GreenER and Grand Traverse Regional Land Conservancy held a guided hike at the site of former Camp Maplehurst. The 70+ hikers, conservancy staff and GreenER committee members heard updates on the status of acquiring the property, had an up close look at the beautiful acreage, old orchards and enclosed lake, and learned of plans to create hiking trails and highlight other natural attractions. Before leaving the property, we spotted a Scarlet Tanager in the oaks near the entrance to the forest. I spent some time this morning reading about the brilliantly colored bird and learned that they are vulnerable to the loss of habitat. Apparently breeding pairs require quite large tracts of forest to nest. 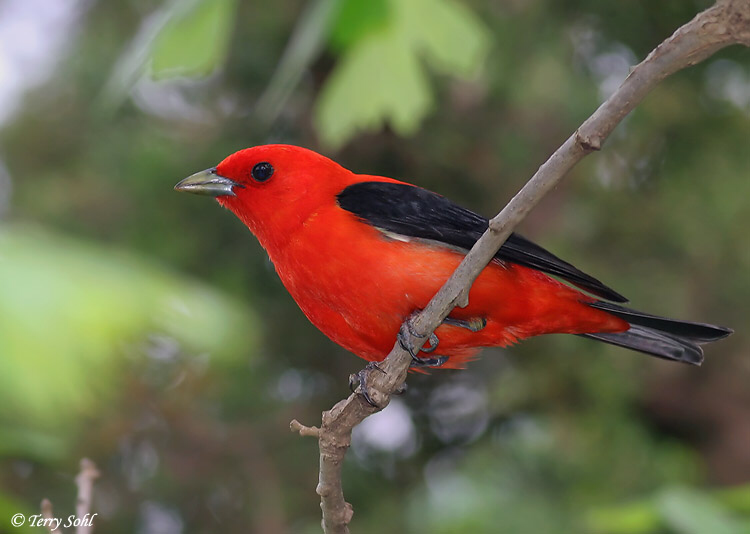 So glad that over 380 acres at Maplehurst is now protected forever for the gorgeous Scarlet Tanager! I am THRILLED that the Scarlet Tanager has a secure home at Maplehurst. Our late staffer Abby Gartland loved that species so much that she named her daughter Scarlet. The only other place that I’ve heard of one appearing in our area is Arcadia Dunes. Wonderful!